Yesterday, the legendary Don Van Vliet, (better known as Captain Beefheart), succumbed to multiple sclerosis. He was 69 years old. Around this point in time, Zappa's music was somewhat of an obsession for me. I'd go to our high school's library, scouring the catalog for magazine articles or album reviews, finding photographs of live performances or just fascinating quotes. "Beefheart" was a name that would just pop up in my research, a presence relevant in a contemporary capacity, which basically meant that I would have to know a thing or two about the guy. For a while, though, Beefheart remained on my back burner. Not sure why. In 2006, I went on a trip to Kentucky to see Tom Waits. My then-fiancee and I stayed at a bed n' breakfast run by two VERY culturally endowed older men, both of them suckers for anything esoteric like Zappa or Beefheart. 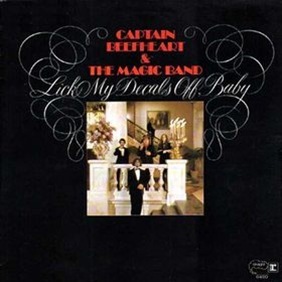 From them, I got a CD-R of Lick My Decals Off, Baby, Captain Beefheart & The Magic Band's out-of-print follow-up to the better-known, Trout Mask Replica. I didn't listen to it until I got home and, when I did, I was both amused and captivated. Beefheart's nonsensical wit and poetic belligerence ("Rather than I want to hold your hand/I wanna swallow you whole/'n I wanna lick you everywhere it's pink/'n everywhere you think") was complimented by the music, whose structure and provocatively primitive assemblage could only be defined as avant-absurdity. His music made much more sense when I read that. 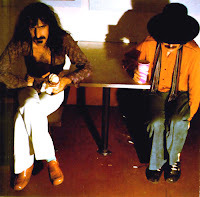 Not that it really had to, but there was some consolation that Beefheart's music was more than just some strange mutated hybrid of free jazz and rock music, but more an aurally-charged translation of the sculpted objects in his head. You don't have to hear it from me to know that Beefheart was a genius-level artist and musician, as his influence continues to be heard by any band delving into the often-alienating waters of the avant-garde. But, for me Beefheart functions as the perfect embodiment of experimental rock n' roll, a first notch in the eventual high art that rock music would achieve in later years. Where Zappa's brand of radical time signatures and mathematical, progressive shifts would represent the merging of rock music and classical composition, Beefheart was a self-taught musician that crafted his own persona and sound, inspired by unconventional mediums and a brilliance that bore a unique vision.